Description: NS 9209 is on the point of a westbound intermodal train at Duncannon, Pa 10/2000. Description: A UP SD-70M adds a welcome splash of color to this NS consist in the former LNE Martin's Creek yard after delivering coal to the MetEd Portland Gen Station. 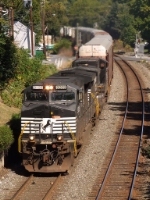 Description: NS manifest 39G rolls west on the Harrisburg Line through Bridgeport at Mill Street. Description: The crew of NS train 152 is no doubt enjoying their Conrail air conditioner on this hot south Georgia afternoon. Description: An eastbound COFC train eases down into Horseshoe Curve with a pair of D9-40CWs for power. Description: Westbound 135 comes down the mainline at Connelly Springs, having just met eastbound 139. Description: NS 135 has stopped to pick up paperwork for their work at Oyama. The "No Trespassing" sign at Oyama is one of the most interesting around, with its reference to Southern Railway. Description: This south bound freight has been tied down for about 2 hours now? Description: NS 36Q takes the restricting signal eastbound at Blandon. Description: South bound NS train 63M rumbles through the 27th Street interlocking at 13:47 with a very proud conductor giving a big wave.